This article presents the findings of an investigation of eLearning & teaching in Arts education in Australian Initial Teacher Education (ITE) degrees. This project used survey and interviews to collect data from academics in 16 universities in 5 Australian states regarding their experiences of eLearning and Arts education. 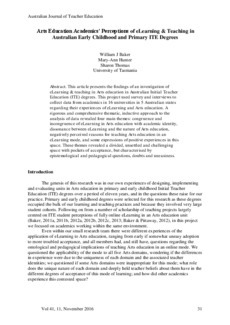 A rigorous and comprehensive thematic, inductive approach to the analysis of data revealed four main themes: congruence and incongruence of eLearning in Arts education with academic identity, dissonance between eLearning and the nature of Arts education, negatively perceived reasons for teaching Arts education in an eLearning mode, and some expressions of positive experiences in this space. These themes revealed a divided, unsettled and challenging space with pockets of acceptance, but characterised by epistemological and pedagogical questions, doubts and uneasiness.